Do you still get giddy over something that has been perking you up since childhood? That is the feeling I get every time I receive a package in the mail. For me, receiving mail and packages is like spotting gifts under a Christmas tree. Although the purpose of Christmas is not about (or should not be about) receiving gifts, the excitement and thrill that awaits you underneath the tree is always there, peaking your curiosity. You anxiously wonder what is tucked away in each package. Big boxes or small, they all hold something of mystery that you secretly can't wait to discover. When I spot the mail pushed into our mail slot or resting on our stoop, I secretly hope that something exhilarating is hiding behind the seal. Typically, my innocent fervor is crushed with the unfurling of bills and advertisements. However, a package I recently received held for me the excitement and wonderment that I crave. 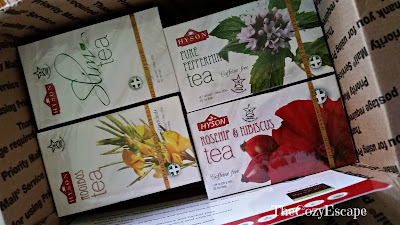 I came home to find a package from Hyson 2U, Ltd., a tea distributer of Hyson teas. As you may know from a previous post, Hyson makes some of my favorite packaged teas, so I was ecstatic to uncover a variety of teas that I haven't yet tasted within the box. 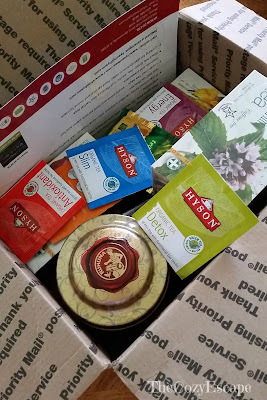 Due to the extreme generosity of Hyson, my very first impression upon opening the package was utmost surprise; there were so many different kinds of teas and packages that I literally felt honored to be granted such a treat. After further investigating through the contents, Hyson's mastery of tea and diligent attention to customer care were immediately apparent as I noticed how they catered their assortment to my flavor palate. They put together a package blending the herby, floral flavors that I love along with new varieties of tea that still have subtle hints of my favorite tastes. Hyson obviously understands how to match your tastes to their teas! The diverse types of teas and tea brands that Hyson carries also struck me. Never spotting it in the stores before, I did not know that Hyson crafted premium loose leaf teas, nor have I seen the organic blends. 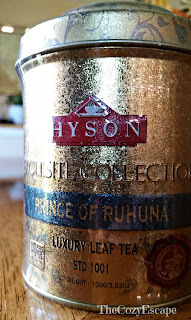 I visited Shop Hyson's website, as listed on their included brochure, and discovered the vast amount of teas that you can purchase through their online store, many of which are reasonably priced (one of my favorite parts about Hyson besides the taste!). There are so many different blends and collections, but the website is user-friendly with its clearly organized navigation bar. 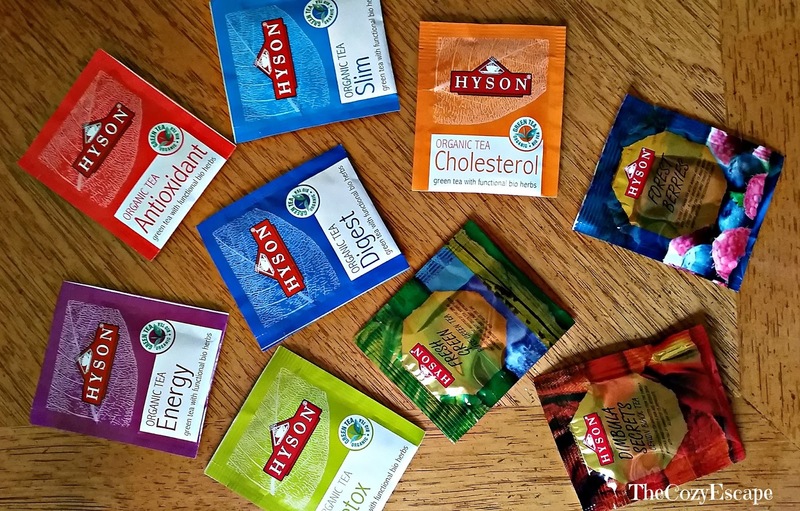 Be sure to check out the teas that Hyson carries; I'm sure that at least one tea flavor will intrigue you like they did me! From the fancy packaged loose leaf tea to the individual tea bags, I am excited to try out these different teas. With every few teas that I try, I will be sure to share with you my honest reviews. 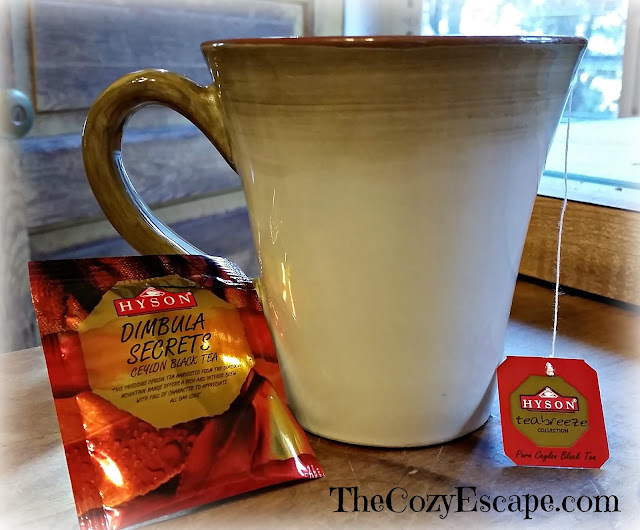 Through my reviews, I hope that you can find a few teas from Hyson, one of my favorite brands, to cozy up with! With so many options, it was hard to decide which tea to try first. Being fall, I chose a shiny, single tea package that shimmered with autumn hues of red and yellow. The name on the wrapper, Dimbula Secrets, also had me wondering what secrets were inside. I'll admit - I often do pick items by their cover. 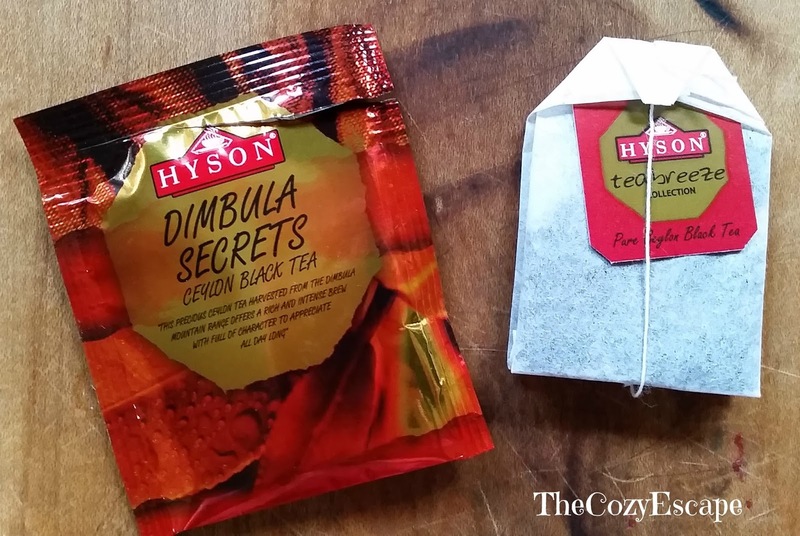 Hyson's Dimbula Secrets is a Ceylon Black Tea part of the Tea Breeze collection. Upon opening the wrapping, the warm, soothing scent rose to my nose. I could already tell that the flavor would be rich from the vibrant strength of the aroma. The directions recommended to steep the tea for 3 to 5 minutes, so I steeped this tea for about 4 minutes. Similar to the warm colors of the packaging, the tea brewed to a beautiful deep amber shade. The tea was also clear and free from any cloudiness potentially caused by packaging. 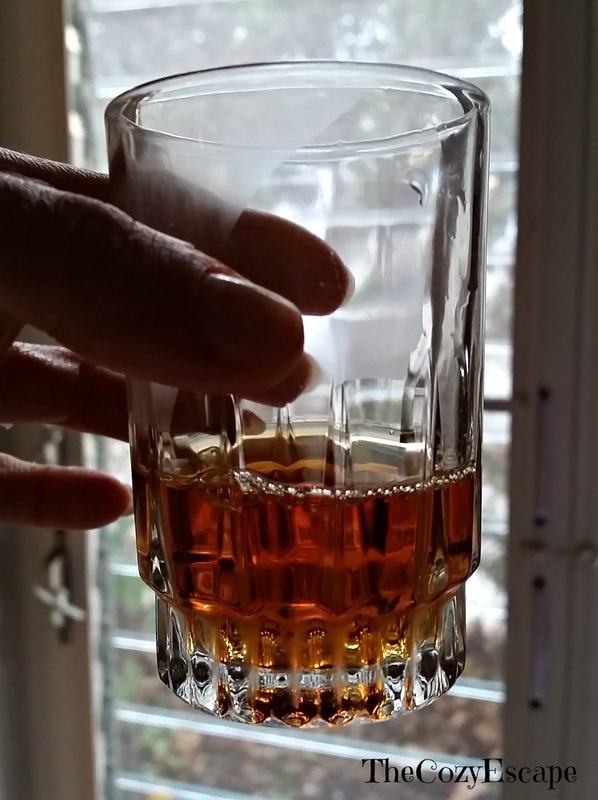 Some black teas can be rather bitter, but with its smooth, creamy taste, Dimbula Secrets is quite the opposite. While Hyson lists that this tea can be enjoyed with or without milk and sugar, the taste of this tea is so silky that I think it can be enjoyed completely on its own. I am not a fan of vanilla, but this tea has that same desserty quality that vanilla adds to cooking. Like vanilla, this tea is not necessarily sweet, but it is soft, warm, and comforting. The flavor is woody without tasting too earthy, so those that are not accustomed to "greeny" teas could definitely enjoy this tea. I wound up steeping two huge full cups using one tea bag, but by the second steep, some of the deep flavoring was already gone. Therefore, this tea bag would make up to two mugs of tea. Because of its cozy "finishing" touch, Hyson's Dimbula Secrets would be best enjoyed after dinner or during desserts!